Perfect to accompany your stylish ceremony, party, or event. Useful in warmer weather, we can fill it with infused water, or something a little more adventurous. 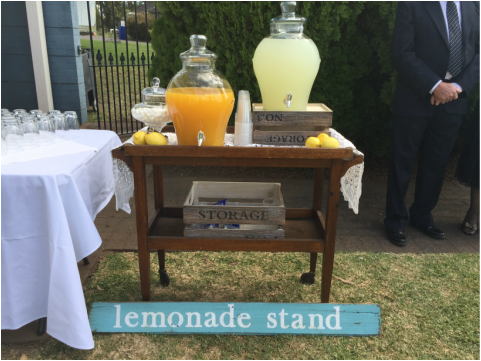 Two 11.3L beverage dispensers filled with infused water and traditional lemonade. 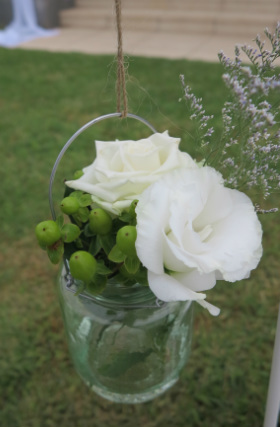 White shepherd hooks are perfect to line your ceremony aisle. Lanterns, kissing balls, or mason jars with flowers can be hung from the hook to create a romantic feel for your ceremony. Perfect to use with our range of shepherd hooks. These jars can be used to hold flowers or tea lights to line your ceremony aisle or help define a space for outdoor functions.